Marten van Wier here again after all these years. 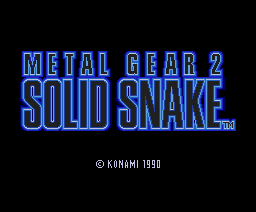 I finished Metal Gear 2 Solid Snake again yesterday, this remains one of the best games on the MSX and games in general. I also think its the best game in the Metal Gear saga now that we can reflect on the series. In case it doesn't work, go to Home of the Underdogs. "ok, earlier someone said that snake was a foxhound n00b. thats not true, before he joined foxhound, he was in the marines, and special forces,"
Wouldn't that still make him a Foxhound newbie? Heh. p.s. raiden is a n00b! this link isn't working..could someone send me a good emulator with a mg solid snake rom?? PLEASE!! If you played MSG 3, you would know that you play as NAKED SNAKE, or later to be known as BIG BOSS. Snake believes The Boss has betrayed her country by joining the soviets in the contruction of a nuclear weapon machine. Yet, if you finished the game, you would know that The Boss was under United States orders. She was not to let Snake know that her plan all the time was to protect the Patriots, and the billions of dollars that was established by the republic of china, USSR, and US. Snake realizes this too late. He had killed The Boss and had earned the tittle of BIG BOSS. Snake is upset with the fact that the boss was a hero, and a true soldier who was faithful to her country. Yet in U.S she was seen as a traitor who deserved her fait. 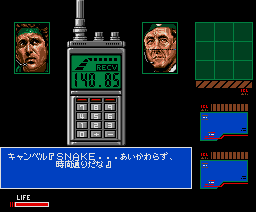 Snake retaliates by contructing Metal Gear, a machine designed by a soviet given to Mr. Emmerich. Snake's plan is to liberate all soldiers, and give them a new begining. HARD TO UNDERSTAND, but it goes something like that. Metal Gear 2 - Solid Snake (RC767), contrarily to the first Metal Gear game for MSX (RC750), was never sold outside Japan. Back in the early nineties only a few copies of MG2 dropped in The Netherlands and Spain (countries in Europe where the MSX system was most popular) thanks to small importers. When it was released, in 1990, I remember that the first part (Metal Gear - RC750) was considered a very good game (of course not the myth that it is today). Metal Gear 2 surpassed the first game of the saga in all aspects: graphics, sound, playability and technical details. The graphics are better. The use of the MSX2 colour palette is superb. The SCC tunes are fantastic. The playability is far superior than the one of its precessor. The box of the game is very nice and comes with a complete and detailed users manual. The only noticable con is that the game is not fast, but this can be avoided playing the game on a MSXturboR computer (or MSX emulator with MSXturboR support) holding the SHIFT key while booting (the game will start in R800 mode). I recommend to you all to play the excellent English version of this game made by Takamichi Suzukawa and Maarten ten Huurne with the collaboration of other people. This game will be included as a bonus on the US Re-release of Metal Gear Solid 3, "Metal Gear Solid 3: Subsistence"
While not strictly legal, there is an English conversion complete with an emulator for the PC for those who wish to play MG: Solid Snake but who not have a MSX. Quite a few forums i've been on have mentioned remakes of the first two metal gears (metal gear & metal gear 2 snakes revenge) but the two are almost the same plus it's the same sorta story line in metal gear solid 2. I quote ocelot "Solidus, you and the boy (raiden) were chosen because your relationship represents that of Big Boss and solid snake"
big boss doesnt turn evil exactly he creates fox hound for a reason... to protect the earth from terorists but when everybody heres about the destruction of what metal gear can do they have doubts so they send solid snake in to stop it. who exactly are the patriots any way i know the philosifers change there names to the patriots but who are they wot do they do? Do you have to have an MSX to play the game? I have it downloaded but the ROM file won't open can anyone e-mail me at koolguy4pres@yahoo.com and gimme a hand here? Also looking for alternative downloads for Metal Gear, Metal Gear 2:Solid Snake, and Metal Gear:Snake's Revenge! (Contined) I have only ever heard the stories. I don`t those games ever made into europe so I will ever play them. But worry,everyone I have a great plan. It would not surpise me if konmai were to remake those two games for the playstation 3 in the near future. That`s right remake both those two titles, Metal Gear and Metal Gear 2: Solid Snake for Playstation 3. That would a great idea. They did with MGS1 on the gamecube with twin snakes so they could easliy do it with these two titles. Not only will it have better graphics but also voice acting as well and finally hear what Big Boss voice would sound like then. I would not be surpiesd if konmai are already planning this as they have comfined Metal Gear Solid 4 will be released in the future. After that`s compled they remake those two prepuels for PS3. Sounds like a great idea does`nt it. Cos komani have already thougt of ideas for future MGS games but they ain`t thougt of this yet i am suggesting it to them now. Cos lots of fans would love this to happen contine the story of Big Boss and find out how he turned evil and also Solid Snake`s past and thier battles as father and son. Once they have served their purpose the people in power have not a problem with discarding them. People such as Big Boss and later Grey Fox could never truly fit into normal society as they have been changed by War, that is when they feel at their best as their skills are important there. yea thats a real good question, why does big boss turn evil after snake eater?? why does he turn bad? Metal Gear(1995)-You play as Solid Snake,a rookie foxhound member hired by the commander-in-chief of FOXHOUND,Big Boss.Big Boss asks Snake to infiltrate Outer Heaven,an armed fortress in Africa,to rescue Gray Fox,the best soldier in Foxhound,Gray Fox's last words were "Metal Gear...".Snake infiltrates Outer heaven,and fins weapons and equipment to solve puzzles and to sneak past unnoticed.He rescues Gray Fox,and Gray fox tells snake that he has to rescue a scientist called Pettrovich,because they are forcing him to create a Metal Gear.So Snake rescues him.Later on,Snake defeats the Metal Gear(a walking battle tank),then he sees Big Boss.Big Boss screams "you have gone too far,too far! ",Snake finds out that big boss was the leader in Outer Heaven,and he was just using Snake to confuse the "west".Then Big Boss tells Snake that he is his son,after that,snake succesfully kills Big Boss,and escapes Outer Heaven. Metal Gear 2:Solid Snake(1999)-A scientist (forgot his name)invented a microorganism called "oilix" because there was a lot of energy loss in the world,and oilix was supposed to preserve energy(something like that),when everyone was hoping for Oilix,the scientist dessapears,the name "Zanzibar land" appeared.The commander of FOXHOUND,Roy Campbell, tells Solid Snake(foxhound member)to infiltrate Zanzibar Land and rescue the scientist that created oilix.Snake succesfully infiltrates zanzibar land.Later,He finds the body of the scientist ,with Dr. Petrovich besides him.Petrovich tells snake that they were being forced to create a new Metal Gear,and that the leader of Zanzibar land is Big Boss,the man that was suposedley killed by snake in outer heaven.Then snake gets a call,and he is told that Petrovich is working on the new metal gear on his own will.Then snake is attacked by Petrovich,but snake easily kills him.later,snake encounters the metal gear,wich was being controlled by his best friend,Gray Fox.After that,snake takes on Zanzibar's best mercenaries.Later,he encounters the metal gear,Snake succesfully destroys it,then he fights Gray Fox,hand-to-hand only,in the middle of a mine field,Snake wins.After that,Snake encounters Big Boss (i think this is when he tells him that he is his son,im not sure)Snake kills him,and escaepes Zanzibar land. Ill write the rest later. better yet type "metal gear edge" in your search engine,it might be more accurate. alright, my problem is, i want to play and beat mg2:ss but american kids never got the msx. they never made it for nes or snes and snake's revenge is nothing like it. i just want to know the WHOLE story line, timeline, EVERYTHING, from mgs3:se to mgs2:sol. PLEASE, someone who knows the whole story feed it to me. i am so interested in it but i am missing a peice of the puzzle. help me out. I have the patch I have the patch! I live in America. While we got this game on our NES (the MSX was never released in America, nor were its later versions), this game was never released here. Instead we were given an American created sequel entitled "Snake's Revenge", which a lot of Metal Gear devotees didn't like. It's unfortunate that America never got to play the true sequel to the original Metal Gear. This is one of the greatest games of all time, play it!!! I am a brasilian boy and learn english to play this game!! Why won't this game won't run on my MSX? !